You are here: Home » MEDIA » Books » Free Speech: Ten Principles For A Connected World by Timothy Garton Ash (book review). Free Speech: Ten Principles For A Connected World by Timothy Garton Ash (book review). 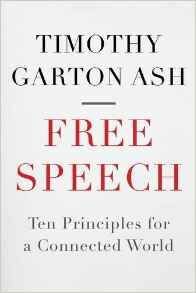 Despite having a long title, Timothy Garton Ash’s book, ‘Free Speech: Ten Principles For A Connected World’ is something that should be of interest to all of you as it examines just how much control each country has over the medium we all used called the Internet. Thought that might get your attention. With half the world having some connection or other to it and growing, the boundaries are forever shifting. With 900 million people also illiterate, mostly in African countries, the need for literacy is constantly growing because without it, you aren’t going to really connect with the rest of the world or let your voice be heard. In case you didn’t know, the word ‘internet’ derives from the word ‘internetworking’, an American term for three Pentagon-funded computer networks from which it was formed. One mistake Ash made is quite a common one. Ian Gibson might have popularised the term ‘cyberpunk’ but it was Bruce Bethke who first used it for a short story title in 1980. Considering the 60 pages of notes at the back, I suppose you’d expect one mistake to get through. The verdict is out on ‘My Fair Lady’. Ash points out that China has been very restrictive of what information is allowed in and out of the country via the Internet. However, something I’ve known for a few years that American search engines don’t necessarily scan information from across the world and can even isolate info purely based off personal taste than show you everything. Indeed some sites won’t even show their contents over here. Even the likes of Amazon can impose their will on publishing companies which does tend to make you wonder as to who imposes freedoms and just what they are. No wonder some companies are confused as to just what laws they should be obeying. Indeed, the label of free speech is purely under the laws of any particular country and I doubt if most people, especially in the so-called ‘free world’ don’t really know how their freedoms are constricted. There’s a ‘Universal People’ list created by Donald Brown on pages 111-112 that should be read that we all have in common. However, its only when you get down to turning them into sub-sections that the diversity expands massively. Even so, it should give you some thought as to finding discussion points in communicating. The more I read this book, the more aware that I became of the background and detail of a lot of things we now take for granted on the Internet. If anything, even Ash doesn’t express any surprise at how quickly some things enter the public conscious. His look at the DIKW (Data, Information, Knowledge, Wisdom) Pyramid belies one little detail that I would always look for and that’s accuracy. We put our faith in knowledge on the Net being accurate but, even as I’ve also pointed out inaccuracies in books I’ve reviewed, it can be compounded here because people won’t always check more than one source or question when some things are copied verbatim which can duplicate faults. Ash’s point about the availability of free information makes a lot of sense. We are currently going through a transitional time for that and just who pays for the research. In its favour is prove of attributing who started something, providing verification can also be backed with accuracy. I found looking over the history of Wikpedia interesting but Ash never covers why people are less likely to look at traditional encyclopaedias any more. Pre-Net, most of us would have to go to the library to look at the likes of the Britannica, yet now it’s on both CD and Internet, it doesn’t come particularly high on Google searches for information. We can’t all be home users of it. Considering how Google can be influenced by paid ads as much as usage, I’m less sure if that’s a good sign. There really needs some thought given to reliable sources for information and verification but who would do the checking? There are a lot of bar charts of comparison across the world here as well. Most of it mirrors off-Net info. It should hardly be surprising that Chinese is the most common language on the Net, with English a close runner-up. This is a lot closer than it is per population now. With translation software becoming more accurate, you have to wonder how long that will stay or will people use language difference as the reason not to look beyond their own language. In some respect, I wish he’d also compared unit population and access as well. Such charts are useful but need a lot more factors examined than be seen in isolation although some of it is covered in the text. Where Ash really hits home is the influence of newspaper owners have over governments. At the moment, we know who these people are but as I commented in my editorial last month, we are getting close to a stage of not knowing who the players on the Internet are and who are most prominent doing this on the Net. The discussion on religious freedom will certainly make you think. Picking out one thing that struck me was Ash saying that fanatics don’t have a sense of humour. Ash’s comments on cults concealing their practices from outsiders also applies to some standard religions. Think about Leonard Nimoy’s comment years ago on where he borrowed the Vulcan salute from as in the Jewish church, the congregation weren’t allowed to see what the rabbis were doing at prayer that he had peeped and later used the hand pose as an adult for Spock. Equally telling is the statement ‘The freedom to offend is a necessary freedom’. It’s impossible to go through life without offending anyone, so probably needs a level of how much is acceptable and how quickly people apologise if they didn’t really mean it in that respect. There is so much I can pick out but let’s end on secrecy and how the security services monitor us. It’s rather poignant that they don’t always inform their governmental controls. There is also how whistleblowers are treated which isn’t good even when exposing bad and often dangerous practices and getting pilloried for it. Certainly, if the government committees can’t do it properly then they need a different way to do things. In many respects, I see whistleblowers as people, when proven right, to be the ones who should be doing the jobs properly than those doing them. A conclusion I drew from all of this is that we are relying on old models to do things and wondering how long it will take for a new generation to initiate changes that will match the real world. As you can tell by the length I’m writing this review, there is a lot I reacted to and a lot I’ve also learnt or been reminded of. For those of you who really want to know just how much freedom you have on the Net, I think you’ll learn a lot. As a collective, especially when you see the reaction to petitions, we’re also capable of initiating change. Just to prevent some areas of paranoia is because we’re all under scrutiny from someone or organisation, I doubt if most of us are really closely watched. There simply isn’t enough people and even the most fluent AI needs more than a couple words to focus on you. Another book that you should really pay attention to this year. « Humans: original soundtrack by Cristobel Tapia Veer (CD review).